Dip Attachment for PR-1000 or PR-1050 This is the awesome dip attachment compatible with both our PR-1000 and PR-1050. Dip exercises are a great way for anyone to build strength in their chest, shoulders and arms all at the same time. Superset dips with pull-ups for the ultimate upper body workout! If you're just starting out and bodyweight is too much, grab some of our Rep Pull-Up Bands to assist you. If bodyweight isn't enough for you, use a weighted dip belt or hold a dumbbell between your legs to add more weight and resistance to your dip exercises. Simple, slide-on installation makes the dip attachment a quick adjustment before any workout. 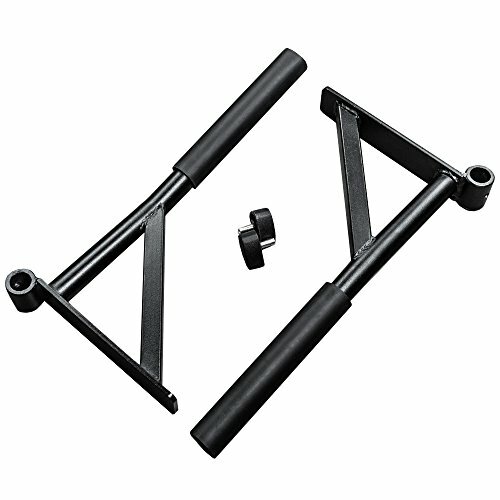 Compatible ONLY with the Rep PR-1000 or PR-1050 (not the Squat Rack or PR-5000).